Prof. Tim Dowling (Physics & Astronomy) studies jet streams using the atmospheric model he developed EPIC, a multi-planet, weather forecast model used by NASA and researchers around the world. Prof. Tim Dowling went to see The Martian as soon as it was released in theatres. He had plenty of company – the movie came in a very close second for top October debut of all time, behind Gravity, another outer space odyssey. But as a professor of Physics & Astronomy in UofL’s College of Arts & Sciences, he has a unique perspective of the film and the science on-screen. Prof. Dowling studies how jet streams – strong currents found in every major atmosphere in the Solar System – form and evolve. He is the lead architect of the EPIC atmospheric model, a multi-planet, weather forecast model used by NASA and researchers around the world to study jet streams and giant wind storms like Jupiter’s Great Red Spot. So when astronaut Mark Watney (played by Matt Damon) faces a massive dust storm on Mars in The Martian, Prof. Dowling can explain the science behind the action. On Jan. 13, 2016, Prof. Dowling shared his insights into recent discoveries on Mars in a talk, Beer with a Scientist, at Against the Grain Brewery. The huge box office success of The Martian was helped by news that same week from NASA that water was discovered on the red planet. Not water that existed three billion years ago, water there today right below the surface. The discovery was actually four years in the making, Prof. Dowling said, but with the official spectroscopy NASA confirmed that in the heat of the day during the summer season liquid water is observable. “It’s a game changer,” Prof. Dowling said. “All life as we know it, as we can imagine it, requires a solvent, and liquid water is Nature’s most reliable solvent.” This summer, he used atmospheric models and satellite data to study how the jet streams on Mars change with the seasons. He and fellow researchers use data from the Voyager, Galileo, and Cassini missions to Jupiter and Saturn, and weather satellite data from Earth and Mars to develop and test theories about the nature of other planets in the Solar System. Other faculty in the Physics and Astronomy Department are also performing planetary research. Though Dowling’s colleague, Prof. John Keilkopf, might have more in common with Matthew McConaughey’s character, Cooper, in the movie Interstellar. 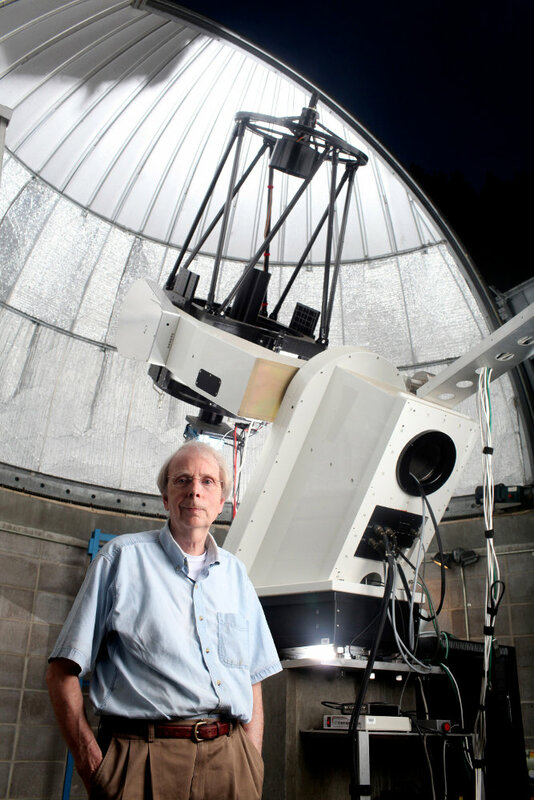 Prof. John Kielkopf (Physics & Astronomy), at UofL’s Moore Observatory in Oldham County, investigates planets around stars other than our Sun. Prof. Keilkopf collaborates with Dr. Karen Collins (Ph.D. UofL ‘15), of Vanderbilt University, and Dr. Rhodes Hart and Prof. Bradley Carter, of the University of Southern Queensland, Australia, to investigate planets around stars other than the Sun. With University of Louisville telescopes in Kentucky and in Australia, they precisely measure the slight loss of star light that happens when a planet crosses the line of sight, and the gentle tug of the planet's gravity on its host star. An analysis of these data reveals the diameter and mass of the planet, details of its orbit, and even whether it has an atmosphere. The light from the star also tells us whether the star has a magnetic field, and may eventually allow us to monitor the "space weather" in the exoplanet's system. Prof. Gerard Williger investigates how these planets form. He works on proto-planetary disks, which he says, is where baby solar systems come from. Stars and their planetary systems form from clouds of interstellar gas and dust. Something triggers the cloud to collapse, and it forms a spinning disk, with the star developing in the center and the planets eventually growing in the disk. New technology in the past 25 years has helped us to peek at the process, with the Hubble Space Telescope and various infrared and microwave telescopes on Earth and in space. Prof. Williger and his Ph.D. student Jeremy Hornbeck collaborate with astronomers at NASA and other universities to study the characteristics and evolution of the disks, and infer clues of the planets developing inside of them. To learn more about upcoming A&S events, visit the university calendar. For more information on astronomy research in the Physics and Astronomy Department of the College of Arts & Sciences, visit UofL Physics Research.